The solar farm built on a closed landfill will produce enough energy to power City Hall and Merrill Auditorium. 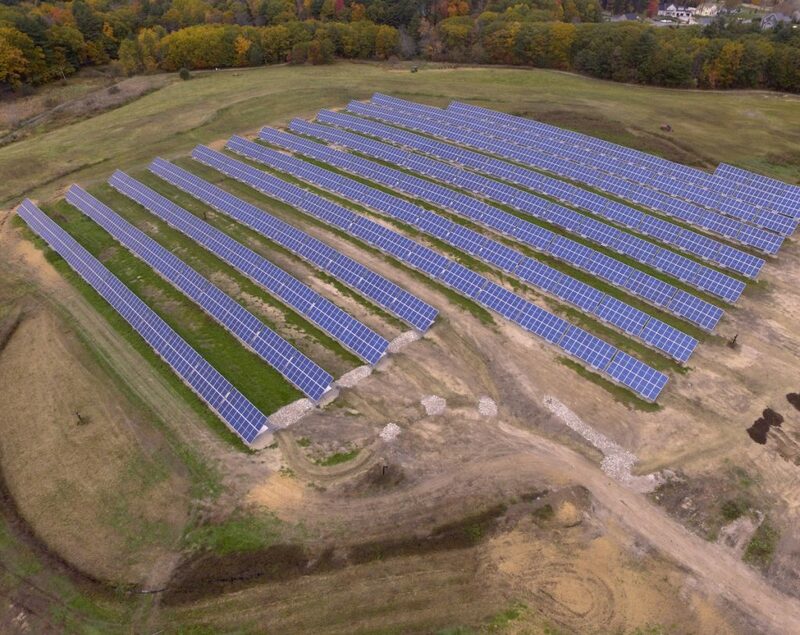 After being delayed for a year because of environmental issues, a 4-acre solar farm built on an old landfill in Maine’s largest city is nearly finished. A total of 2,816 solar panels have been installed, more than enough to power City Hall. Central Maine Power now must run electric cable to connect the panels to the electrical grid. That work is expected to begin next week and be completed by Nov. 16, CMP spokesman John Carroll said. Once that happens, Portland officials will flip the switch and the city will be one step closer to meeting its goal of reducing greenhouse emissions by 80 percent by 2050. Moon said the array is expected to produce 1.2 million kilowatt hours of electricity a year. That’s about 3 percent of the city’s municipal usage and enough energy to power City Hall and Merrill Auditorium for one year. “When it is turned on, City Hall will be powered by the sun!” Mayor Ethan Strimling crowed on Twitter on Thursday morning. Work will still remain at the Ocean Avenue landfill after the solar array is turned on. The city needs to spend another $1.1 million to fix environmental issues that came up during the permitting process for the solar farm. Many of those issues had been flagged by state officials in the 1990s, but had not been fixed by the city until the problems delayed work on the solar project. A similar solar array was built and activated last year in South Portland. That one also generates 1.2 million kilowatt hours and was considered the largest municipal solar array in the state when it went online in October 2017. Both South Portland and Portland signed agreements with ReVision Energy on Feb. 22, 2017, and hoped to move their projects forward on similar time lines, so their arrays could be up and running by the end of 2017 to take advantage of higher electricity rates. But Portland was waylaid after the Maine Department of Environmental Protection flagged environmental problems with the city’s landfill that allowed waste to break through the cap covering the landfill and allowed toxic leachate to seep out. Portland had to develop a plan to address those issues and fix a portion of the cap before its solar array could be installed. Officials later downplayed the importance of having the project on line by the end of 2017 to take advantage of the higher utility rates. The landfill work is particularly important for Portland, which will be paying the array’s owner, Kenyon Energy, a premium for electricity until the city decides to purchase the array. Until the city owns it, Portland would have to pay for any electricity that is not generated if the array has to be taken offline or dismantled because of regulatory or other site issues. South Portland’s project, which includes 2,944 panels, went much smoother at its 34-acre landfill at 929 Highland Ave. City officials flipped the switch just over a year ago and since then they have had no issues with the array, which has produced 95 percent of the estimated 1.2 million kilowatt hours of power expected, said Julie Rosenbach, South Portland’s sustainability director. It generates about 12 percent of the electricity used by the city and its schools. Josh Baston, a manager at ReVision, said minor fluctuations in electricity generation are attributed to weather. He said performance within 10 percent of projection is generally considered “excellent,” while noting that South Portland is only paying for electricity that’s actually produced. “The South Portland array production is in line with arrays in the surrounding area which have experienced similar weather conditions over the past year,” Baston said. South Portland has a web page that tracks the power that’s generated at the landfill in real time. Moon said Portland would have a similar web page showing electricity generation. A page already exists for a 23-kilowatt solar installation done over the summer at the Riverside Golf Course. Moon said those panels charge golf carts. He said the $17,000 project would pay for itself in 15 to 16 years. 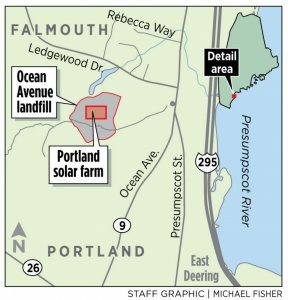 The issues at Portland’s landfill at 1026 Ocean Ave. were partly because of a lack of maintenance. The site is also a popular recreation space, with trails and an ocean view from atop its 50-foot mound. Use of the trails by people and ATVs compacted the soil and caused erosion, the state said. As part of its DEP-required upgrades, Portland has installed vents for methane being produced by the landfill, which was informally closed in the late 1970s. It had to restore topsoil on the landfill to 24 inches, after the previous cap was either inadequate or eroded by hikers and weather. And the city had to install fencing around the entire 45-acre site. DEP Project Manager Matt Young said the city has until the end of 2019 to fix the rest of the landfill. “So far, so good,” Young said of the city’s progress. Except for the landfill work and the $50,000 cost to connect it to the electrical grid, the city has not paid any money for the solar array. Instead, the city will pay a premium for electricity that is generated by the array and then have the option of buying it outright. Moon said the city will pay 10.5 cents a kilowatt hour for the first two years, which will be increased by 2 percent annually thereafter. The city will have its first option to purchase the array in year seven at an estimated cost of $1.6 million, he said. City officials admitted the old landfill had long been neglected. However, Portland also has stumbled in its efforts to address those problems. It was ordered by the state to remove 700 cubic yards of topsoil that was added without properly testing it for contaminants. And the state also ordered the city to remove a portion of a new fence it installed to keep people off the landfill because the fence was installed on the landfill cap, which should not be breached. Last fall, the city installed a 4-foot-tall fence to keep people and animals from coming into contact with hazardous leachate. Young said the city was later required to install an additional 7-foot fence around the site to meet electrical codes. Public Works Director Christopher Branch did not respond to interview requests Wednesday and Thursday to discuss the landfill remediation project. But a city spokesperson said the second part of the landfill project is projected to cost $1.1 million. That would be on top of the money already spent. Last year, Branch originally estimated the landfill remediation would cost $70,000. But the estimate rose to $220,000 after officials realized they would not be able to use gravel from the State Street reconstruction project to cap the landfill and would instead have to truck in clay-heavy fill from Gorham. An additional $70,000 was needed to install vents for methane.